We all love cruising but what are the cruise companies main interest? Is it to provide you with a good service or to make a nice healthy profit? Do they put you first or their bank balance. Your views are welcomed. I am of the opinion that most lines are happy to take your money but should anything bad happen they wave the T&C's and wipe their hands of any responsibility. Cruiselines in my opinion are counting their money before considering customers. However without customers they won't make any money. I agree...they are in it for the money...they have to be doing something right though, seeing as how we all keep going back. Cruise lines are a business with stock holders. Their ultimate goal is to make money. The fact is that the cruise lines also know that to make the most money they have to provide a certain amount of service to the customer so that the customer returns and puts out a good word about the cruise they take. Cruise lines, even though they do have a little bit of all types on their ships, do cater to specific type of client. That is why one cruise line is not good for everyone. 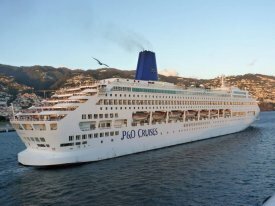 Some american owned cruise companies operating out of the UK now have a financial officer who visits their cruise ships and liners and tries to find ways of raising more revenue out of the passengers or ways of cutting back on services ! Last year on the american owned P & O Cruises ' mv Oriana ' the bathrobes in the deluxe verandah cabins were no longer available although they had been in previous years ! No wonder they make enough profit to build these mega size cruise ships which are too big to visit some ports so their passengers are on board for longer and also spending more ! Another money saver taking place is to save on fuel costs by running at slower speeds between ports and then also spend less time at the ports so the passengers are on board the ships for longer ! Some brochures no longer state an actual time arriving and sailing from a port so times can be ajusted to benefit the owners of the ships ! Picture shows the 1950 built ' P & O ' ss Chusan ' which operated cruises from the UK from the 1950's to the 1970's when the P & O company was British owned and all meals, including a full silver service, were included in the fare paid ! There was no pay to use restaurants ! Cruiselines think of money before people. I believe they need to trim their prices, especially when they own the dry dock companies. If prices begin at $100 a day, it leaves little room for other lower currencies and puts a strain on the dollar. On the latest cruises I have taken they don`t have customer response forms, and now ask you to complete a questionnaire online, which is generic and simple, and does not give the customer a place to make detailed responses. When you look at the company reports and see the salary and bonus the Directors get if they need to continue to build these massive new cruise ships then in the future you could be paying if you sneeze on board or maybe use a public room loo ! This is why I like our Cruise & Maritime Voyages company which is buying up the older cruise ships, putting them on the UK market as 3 star cruise ships with fares starting on some cruises from about £ 45.00p a day and only charging 25% extra for a single cabin. Although the cruising company is British the ships are mainly Greek owned and still dry-docked every year at the Damen drydocks in Holland unlike a lot of the Carnival group ships which now get drydocked every three or four years and often at a shipyard which they own or part own ! Re the comments forms while I was on the ' ss Oriana ', and our home port was Sydney in Australia for around seven years, all the passengers got a form and while I was on board the satisfaction rate would be about 96.4 % which was the highest in the company. It did go down a bit when I was on leave but was soon back there on my return and for which I was always proud plus we had a very happy crew as well. Picture of the ship which when built in 1961 was the third largest pasenger ship in the world at about 42,000 grt and also the first to be fitted with side thrusters. We carried about 1,350 passengers on our Australian cruises with a crew of about 800. She had steam turbines and on her trials she did 31.75 knots and was designed to operate at 27.5 knots. Her fuel consumption was heavy at about 450 tons a day ! She also displayed a golden cockeral above her bridge which was made of brass, and which you can see in the picture, as she was fastest ship in the P & O fleet, while still British owned, and held the records for the fastest crossings both ways of both the Indian and Pacific Oceans by a passenger ship ! We also visited the drydocks at Singapore every year for between nine and fourteen days ! She was withdrawn from service in March 1986, when the oil price rose, and was sold to the Japanese to become a conference centre and museum ship at Bepu on the Japanese inland sea which is a thermal sands resort. That was when I retired from the sea, having been with the company for 35 years, and got a very large redundency package ! Obviously both. Great service= more customers. More customers= more chances to improve their service. But of course, profit first above all. The new mega size cruise ship earn much profit for the companies owning them ! After the Directors have been paid massive amounts then the shareholders get some of the profit ! Carnival Cruises started with three second hand passenger ships in the 1970's. Now look at the size of the Carnival group of companies much of it as a result of the profits made from their ships ! plus they are destroying the history of the P & O company with the re-painting of their ships ! The previous buff coloured funnels are now painted blue and the gleaming white hull is covered in graffiti, as shown in the attached picture, which results in the ship no longer looking like a big yacht when in port. !